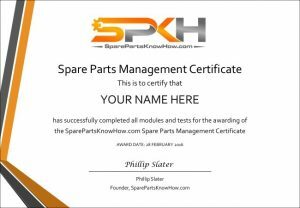 To determine which of our spare parts management training options is right for you, simply work through the following five questions. Question 1: Do you want more than training? Yes: If you want more than just training (e.g. full access to our content and advisory support) then please progress to Question 2. Question 2: Are you an individual or do you want to train a team? Individual: If you are looking only for yourself then please review our Full Access and Support Membership. Team: If you want to train your team, then please progress to Question 3. Question 3: Is your main focus for your team to reduce and optimize your inventory? Yes: Please review our Inventory and Optimization program. No: If you need something else then please contact us to discuss. Question 4: OK, so you only need training but are you an individual or do you want to train a team? Individual: If you are looking only for yourself then please progress to Question 5. Team: If you want to train your team then please review our Company-wide training options. Question 5: Do you have the discipline to do the training without an instructor? Yes: Great! Please review our self-paced training. No: We understand, sometimes we all need structure. Please review our Instructor-led training. If we have not yet answered your question then please contact us.